Have you ever tried to record streaming video? No, do you want to try it? Are there times when you see millions of videos and feel like playing them back again in the future but cannot? Do not worry now you can do that and successfully stream videos and watch them whenever you want and on any device that you want. You must have often faced the problem on online sharing websites of being able to download. It can be very difficult to watch a high quality video and TV shows online. The time to load the video, the buffering interruptions can make it all a mess. Movavi screen capture studio is very handy software that will let you record and save online videos in any format for any device that you want. Download and install the software right away and follow the installation wizard instructions to complete the process and run the program. When you launch the program you will notice a yellow frame that is the boundaries of the capture area. You can adjust its size according to the one that you would like to record. There is an option of full screen under the list of size of presets which you can choose if you wish to record and view in maximum resolution. Next make sure that you have a green checkmark over the System Audio icon. If the same is not there simply click the icon. 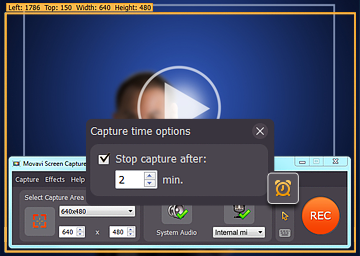 There is a capture timer which you may use if you have to leave the screen while recording is going on. You can set a time and the timer will get stopped at the specified time duration. Click on the Rec button to start recording and you can even watch or play the video that you are recording at that very time. Once the entire video has been captured click on Stop. There is a separate preview window that lets you see and check the thing that you just captured. If you feel like the clip needs some editing and changes, click on the Edit button. The in- built editor lets you do a lot of things to your video clip like cropping, rotating, merging and splitting. You can also enhance the video quality by using the filters available. Once you are done with the editing or you have a clip that you think is perfect, you can save the recording in any format that you would want or even convert it into a proper format that is suitable for any mobile device just after you have completed screen capturing. You can choose from the wide range of format list both for audio and video files. Click on Save and your job is done.